It is a beautiful morning here in Sturgis! 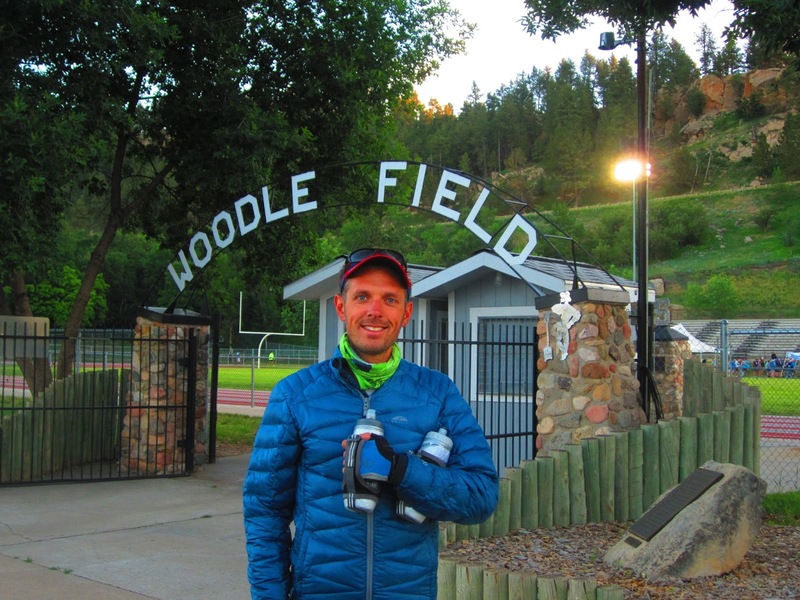 Mike (#45) is off to a happy start and ready to explore the Black Hills today. We couldn't have asked for better weather and we look forward to a fun day! Staying right on the University of Utah campus, and walking around during the day, gave me a nice feel of a heretofore unknown-to-me campus. The University of Utah is nestled right along the foothills, and has fantastic trails just blocks away from the dorms. Within just a couple miles, the intrepid undergraduate can gain a 2000' and summit Mt. Wire. It's also popular to head to the top of Red Butte Peak, an unofficial sub-summit with a more direct view of campus. I ended up there, by hitting the saddle with the Mt. Wire summit, and then enjoying a technical, rocky ridge run back along the spine toward Red Butte. I only explored for a few breakfast miles, and wound along one of the small, shaded canyons of the Bonneville Shoreline Trail, but even more miles and trails abound from campus, from very runnable crushed gravel to steeper, technical trails. It seems like just about the most ideal trail-running setup near a major University campus in the lower 48 that I've seen, or at least up there with Boulder (which gets a slight nod above Ft. Collins for accessibility of summits)...what other contenders are there for "best trails near a major public university?" It's too bad the bike infrastructure could/should be way better in SLC. So I found myself in Salt Lake City, UT last week for a conference. Driving there, and arriving a day early, I looked for a solid morning hike/run that would get me somewhere up above treeline. I drove down Big Cottonwood Canyon from Park City to SLC the night before, looking for someplace to sleep, but learned that the campgrounds closed at 10pm (with one-way spikes to prevent driving in after-hours!) and there isn't much in the way of accessible, public land otherwise. As it was, I found a parking spot in a dirt pull-off near a campground, and got some restless sleep during the night. Anyway, I eventually made my way to the Butler Fork TH, about 10 miles up the canyon. The trail started out a bit steep, and I had no problems practicing hiking for most of the uphill. Quickly ascending from the canyon, the trail switchbacked through thick forest, before popping out in the wildflower display of Mill Basin. The trail winds its way to Baker Pass, which is between the lumpy, almost non-descript but comically-named Gobbler's Knob, and the more impressive-looking Mount Raymond. I headed climber's left to Raymond, first. A little less than half-way on the climb along the ridge is this "mini knife edge:"
The rock is absolutely solid, and it's easy to get along the top, but a fall to the left would still be unpleasant, if not fatal. I know people can get across these things without thinking (I met a few people on the way to the summit), but it still gave me pause. I worried about downclimbing it on the way back, but it was quite easy, so I think I just need to get some confidence back. Anyway, fun scrambling, then a little looser but easy hike right up to the top. Great views all around! One could skip the knife-edge (and/or make a faster descent) by bombing straight down to the basin, but I decided to check out the Knob as well, which was just a grunt up a false summit or so. I actually went past the summit and then realized the next lump afterward was most certainly lower. Although I think it's the more popular and slightly higher point, it's not as interesting or nice of views as Raymond, but it has a nice view of Raymond. A good way to survey your route. I understand it's a good backcountry ski destination, and I can see why, with nice grassy slopes facing several different aspects, with the steeper approach being safely ensconsced in the trees. There are also some classic ridge-run routes involving some of these peaks, connecting between the major canyons. Finally, the trail goes near Dog Lake, which is on the Wasatch 100 route -- I can definitely see the appeal, having known almost nothing about the area previously. Anyway, the trail down was very runnable, and I had a blast opening up the throttle. I caught up to the other folks I had seen, accidentally startling a couple, and then also exchanged greetings with a grey-bearded man wearing a kilt. Cool place! 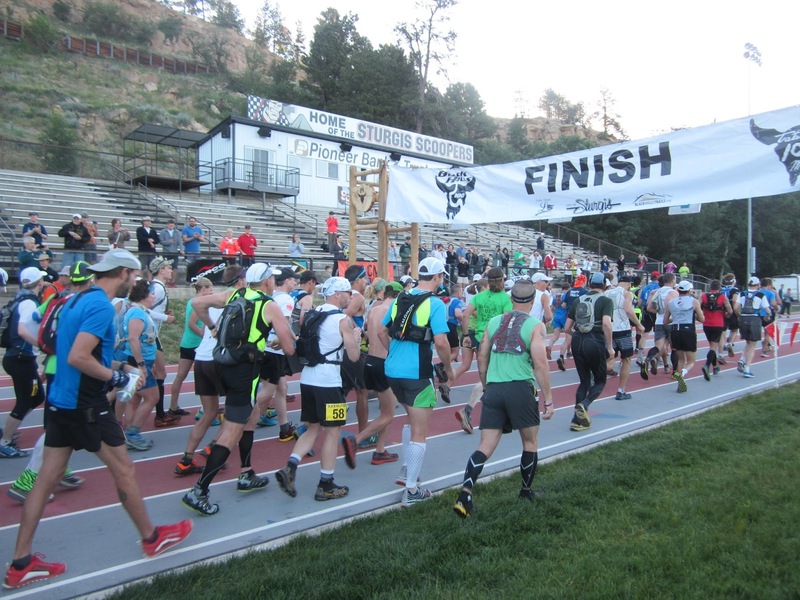 A windy Wyoming Saturday was on tap, with the famous Pilot Hill 25k continuing its streak as Wyoming's oldest consecutive footrace. 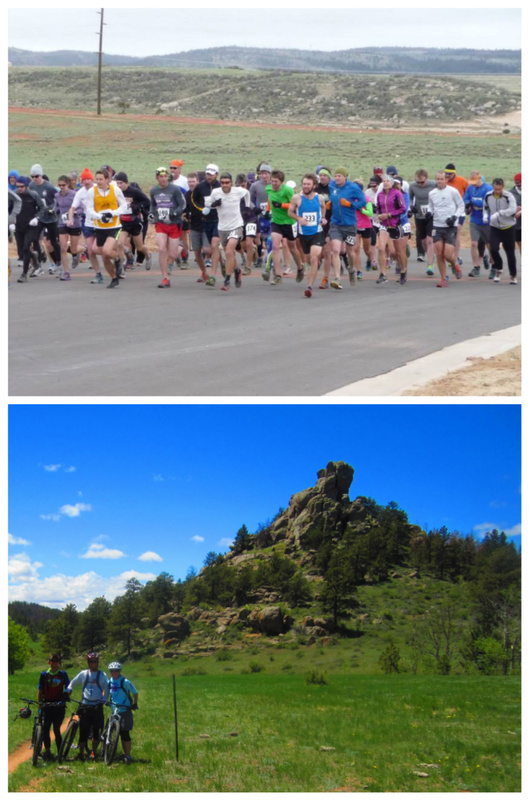 Seemingly more Fort Collins runners than ever (and some Denverites as well) made the trip up north to join our High Plains Harriers brethren, for an always enjoyable jaunt through field and rock in swirling gale-force winds. 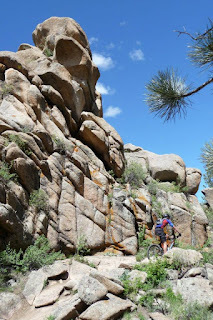 Additionally, Alex, Nora, and I had learned of a bike demo day at Curt Gowdy State Park, which is known for fabulous mt. biking trails within 90 minutes of Fort Collins (but pretty much along our return drive from Laramie), so it seemed like an even better usage of fuel and time to check that out as well. This was the 37th Annual Pilot Hill 25k, and my 3rd in 4 years. The first time I ran it, in 2010, I wore a maxi pad, and then fared better last year. I hoped to improve upon that. In previous Wyoming races, we've left decent weather in Fort Collins, only to have the weather turn worse as we cross the border. This time was no different, but at least the winds and clouds gave us warning by being generally terrible even before the border. Thankfully, precipation stayed mostly at bay (with only a slight, quick drizzle/mist near the top), so it was otherwise a battle for positioning; not only in the race itself, but in a battle to stay upright. I forced myself to start more conservatively this year, since I shot out a bit too fast last year, and hoped to run the downhill more aggressively. We all watched Nick lead and he had no takers on his coattails, so then we had a couple separate groups of 3 that split off. I remained between 6th and 8th on the climb, hoping to settle in consistently and save something for the downhill. Three of us essentially arrived at the top at the same time, in the same positioning. I grabbed some quick Gatorade (actually, one of the fellow racers handed it to me), then headed downhill. 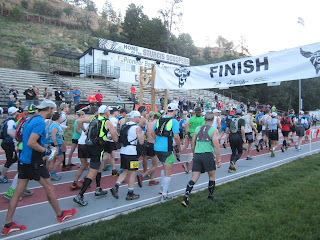 It was nice to see some competitors and friends directly behind and along the course, and I suppose I got so distracted that I missed a flagged left turn just a few minutes below the summit. Luckily, some other racers shouted my to my attention, as I promptly lost about 40 seconds and almost 2 spots. I had trouble being battered by the headwinds in some of the flatter areas, wishing I were more compact, but enjoyed pushing the rocky technical areas. 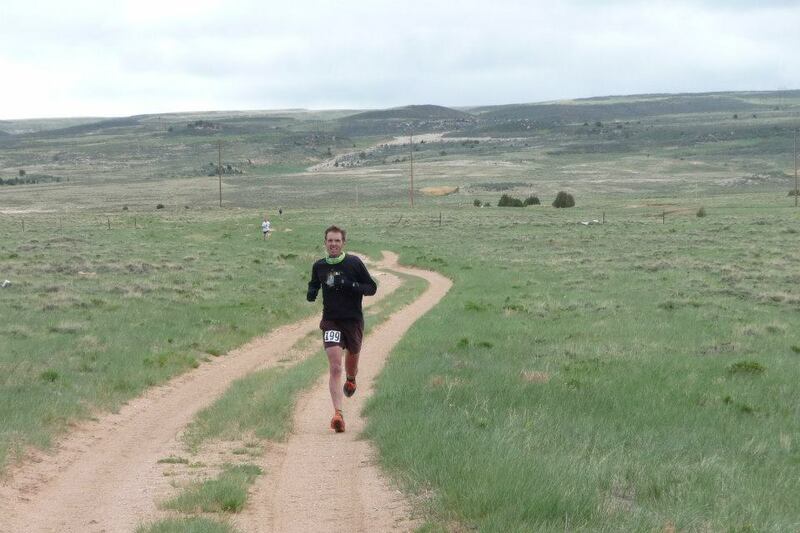 Without sunglasses in the stiff wind, I only had a blurry sense of the terrain, so it was mostly running by faith. Lee mentioned that in-the-know Wyoming harriers run with clear safety glasses. We settled into position and I gave up on catching anyone, which meant being out of the top 5, but just wanted to stay where I was -- with long, exposed views across the prairie, there's nowhere to hide. 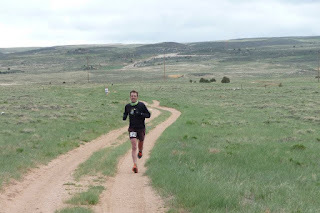 I had another goal of beating 1:50 (which was good enough in previous years for 3rd place), but just missed that, finishing behind a bevy of talented Wyoming XC runners. And Nick. Plus, Alex and I saved some energy for mountain biking. Mostly, though, it's about a fun, low-key race with friends on both sides of the border, which also has Jeff's great microbrew and an awesome breakfast from Turtle Rock Cafe. I'd rather be winded by a buffet than buffeted by the wind! I should also mention that I'm quite a fan of the t-shirts: soft cotton, nice fit, understated and classic design in muted tones. I am quite pleased with this year's handsome blue version. A convenient extra layer to put around after the race to avoid freezing! And still one of the best bargains around at a buck per kilometer: $25 and a stamp for race entry. And then it was off to Curt Gowdy. We brought our bikes with us, just in case, but Bicycle Station and Specialized had a great setup in the parking lot for checking out demo bikes, so we left ours on the hitch, and grabbed an assortment of $4000-$6000+ bikes(! ), with Alex and I on respective Stumpjumpers. Although happy to pay the State Park entrance fee ($6), we were additionally pleased to learn that it was a free entrance day. We had our free reign of the park for a few hours, and the classic intermediate suggestion from Nora, Caleb, and the guys in the parking lot was the Stone Temple circuit. 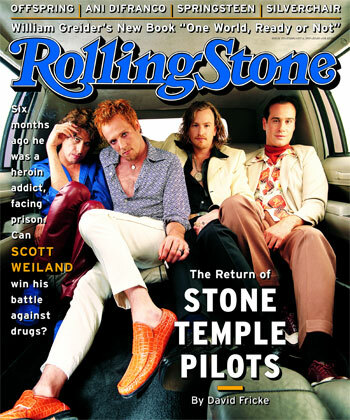 I think Alex and I both realized that "Stone Temple" after "Pilot Hill" was a natural combination. Where'd you go with that mask I found? Riding counterclockwise, we enjoyed nice gradual climbs through meadow and woods, stopping often at trail junctions for pictures. The buff trail quickly gave way to moderately challenging rocks, and then even tighter features. I could see how it would be a fun challenge, but beyond my pay grade, to clean it all -- but note that there are miles of even more challenging trails and play areas that we did not explore! Definitely a lot of potential there. We added "Albert's Alley" and "Pinball" was well, which eventually took us to a spur junction with Hidden Falls. Nora recalled barely a trickle in a previous visit, but like many front range flows with the late snows this year, the falls were going full blast, and were a worthy diversion at the end of a small slot canyon. Despite freezing earlier in the day, with the sun now out, it was too tempting not to take a dip. Plus -- albeit in the opposite order -- no triathlon is complete without a swim. It took a little courage to take the final leap into the swirling punchbowl (in late summer, it might be a calm swim), but the faith paid off by finding a small hidden cave behind the falls. We looped back to the parking lot and tacked on some leisurely riding along the lakeshore, before reluctantly turning in our expensive steeds, knowing that there were many more miles of trail to explore. It's not the best place for the long but less-technical cross country rides that I generally prefer, but it's definitely a place worthy of its reputation for well-constructed and well-signed trails specific to mountain biking, and definitely a great place to hone the technical skills I don't have. 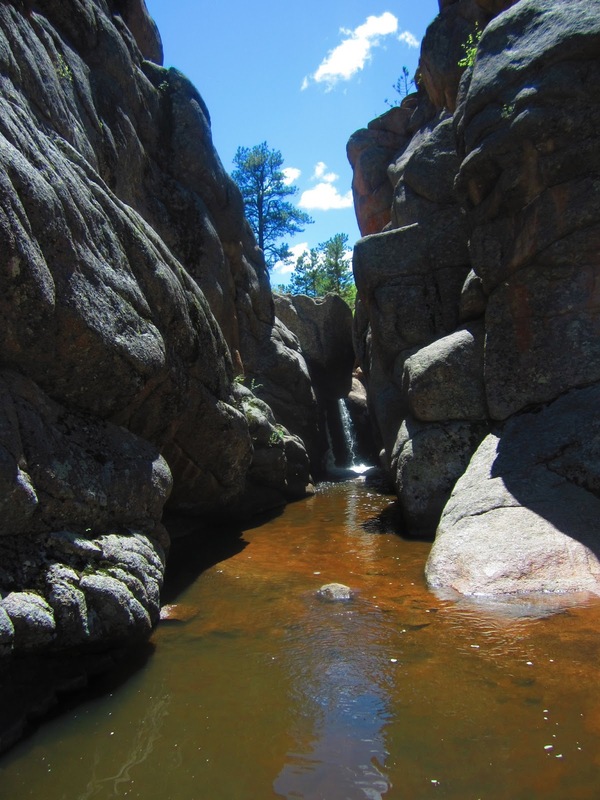 Being an easy drive from Fort Collins, with ample camping and fishing opportunites without being overly crowded, I look forward to more exploration.